I know this goes without saying, but Stonehenge really was the most incredible accomplishment. It took five hundred men just to pull each sarsen, plus a hundred more to dash around positioning the rollers. Just think about it for a minute. Can you imagine trying to talk six hundred people into helping you drag a fifty-ton stone eighteen miles across the countryside and muscle it into an upright position, and then saying, "Right, lads! Another twenty like that, plus some lintels and maybe a couple of dozen nice bluestones from Wales, and we can party!" 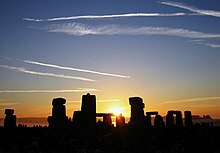 Whoever was the person behind Stonehenge was one dickens of a motivator, I'll tell you that. Hello, Stonehenge! Who takes the Pandorica, takes the universe! Eleventh incarnation of the Doctor, in "The Pandorica Opens" episode of the Doctor Who television series. Every age has the Stonehenge it deserves-or desires. And the children dance to the pipes of Pan. And here be chose again to rule the Land. But, He restor'd, 'tis now become a Throne. This page was last edited on 30 April 2018, at 11:35.